Reasons abound for not taking time to study the Bible. Perhaps the most common is time—I don’t have enough time for study and prayer. Schedules are indeed maxed and yet in conversation one hears about recent TV shows that are being followed or movies that have been watched, repeatedly. Indeed, the average American watches four hours of television a day. 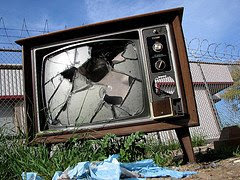 In a 65 year life span there is a possibility that this “average” American will have spent nine years watching television. In this environment how do we avoid setting before our eyes anything that is worthless? The psalmist was seeking to walk a life of integrity. Throughout this psalm he lists what he wants to set before his eyes. As a Jesus follower we should keep a list as well. God wants to be our only image maker. In order to stay focused on who He wants us to become we’ll need to keep in front of us those things that will help us walk a life of integrity. There is a battle for our attention. Acknowledging this struggle is to begin making a conscious choice between the worthless and the worthy. having a vision for me. me in its own image. Your comments today remind me of the advice of Colossian 2:8--"See to it that no one takes you captive through hollow and deceptive philosphy, which depends on human tradition and the basic prinicples of this world rather than on Christ." It truely is a challenge every day to focus on God's perspective rather than the world's!